Those readers familiar with Barney White-Spunner’s splendid study of the Horse Guards will be delighted with this work published to celebrate the bicentenary of the battle of Waterloo. The author reminds us that ‘The Battle of Waterloo is arguably the British Army’s most famous victory and certainly one of the most significant it ever fought’. Having fought Revolutionary and Imperial France for 22 years, by 1814 the British army was battle-hardened and terribly good at its job. But, with Napoleon in exile and the Bourbons restored to the throne, the British government of the day, in a mood we are all familiar with, could not wait to cut expenditure and began disbanding the army precipitately. Some veteran battalions were shipped off to America, but tens of thousands of men were dismissed from the army and thrown onto a market rapidly shrinking as war contracts were drying up. Those soldiers retained in the home country soon found themselves dying of boredom. Until the news burst upon an astonished Europe that the ‘Corsican ogre’ had escaped from Elba and was not only back in France, but back on the throne of France. Whitehall went into a panic as it was required to raise a new army for service in Flanders against the new threat. The veterans greeted it as ‘glorious news’ and soon found their ranks filling up with many volunteers who had never heard a shot fired in anger. The description of how this army was put together is one of the best parts of the book. It is a fine study of the organisation and equipment of the British army in 1815, but more importantly a deep understanding of the officers and men in that army. The officers were not all rich landed aristocrats; the men were not all criminals ‘enlisted for drink’. With a mean age of 22 years, these men were a cross section of British society; many were volunteers from the militia and relatively well educated and partially trained. What they all had in common was a fierce pride in being ‘freeborn Britons’, with that intense level of patriotism that would see them endure extraordinary hardships rather than fail in their endeavour. (Sadly, there was a downside to that level of pride that led to a pervasive abuse of most of the foreign troops they served beside - perhaps excepting the King’s German Legion). Rushed over to Belgium in April 1815, the army had to complete its organisation and training in the field. There is a useful discussion of the various components of the army, not just the cavalry, infantry and artillery but also the medical services and the role of army chaplains. The discussion of discipline and morale is particularly interesting. The frequent use of the lash to impose discipline was a peculiar aspect of this proud army, but the attitude of the men to it and the officers who handed out the sentences is surprisingly accepting of its need. More attention is paid to the high morale that was the glue that held this army together. Writing with the understanding of a British regimental officer, the author makes it quite clear that the principal motivation is not any appeal to ‘do one’s duty’ (which annoyed the soldiers who rather resented the idea that such an appeal was necessary) but more importantly the fear ‘that they would not do the right thing and that they would let down their comrades or their regiment’. We learn that 933 British soldiers were reported ‘present sick’ on 18th June - men who should have reported themselves to the nearest medical officer but who couldn’t bear to be away from their mates when the business at hand was about to kick off. There is a good description of the retreat on 17th June, which was described at the time as ‘the prettiest field-day of cavalry and horse artillery ever seen’. We are reminded that the pursuit of the retreating French from 19th June onwards led to some hard marching and fighting, but also meant that the wounded had to be left in the care of a severely overstretched medical service. There are harrowing stories of wives and civilians looking for news of the fallen. This battle of extraordinary violence was fought in an incredibly small space, leading to the dead and wounded men and horses falling in heaps across much of the field. It was as bloody a field as any recorded in military history. After it the British would not be engaged in war in western Europe for nearly a hundred years. This helps to explain why it achieved such iconic status in the nation’s history and why the bicentenary is being greeted with such great commemoration. 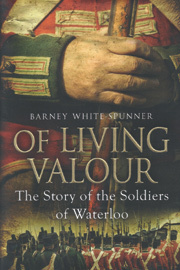 OF LIVING VALOUR - The Story of the Soldiers of Waterloo, by Barney White-Spunner, is published by Simon and Schuster.